Blue Ridge, Ga. – Change and growth have become inevitable in the City of Blue Ridge. Cindy Trimble, a board member of both the Planning Commission and the Zoning Board of Appeals, brought before the Blue Ridge City Council on Tuesday a small step in establishing direction, consistency, and beautification of our growing town. Trimble along with help from council member Nathan Fitts rolled out conceptual drawings for new way-finding signs in Blue Ridge. “It is critical that we have a plan for signage,” Trimble stated due to growth, extra pedestrians, and extra traffic in the area. 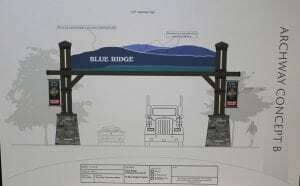 Proposed design for City of Blue Ridge archways that will direct visitors to downtown. The designs included newly structured street signs with stone bases, covered kiosks with maps of businesses downtown, and gateways to the city. Trimble noted that those traveling along Hwy. 515 often do not know where to turn to enter the downtown historic area. The gateways would be strategically placed in five areas to direct visitors to downtown. 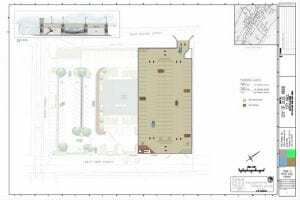 Trimble proposed placing the gateways on East First Street and Hwy. 515 near Bill Holt Chevrolet, Cook Street and Hwy. 515 near Burger King, West First Street and Hwy. 515 near McDonald’s intersection, Windy Ridge Road and Hwy. 515, and lastly Orvin Lance Drive and Hwy. 515 near CVS. “Because these are city owned signs we cannot put them on the DOT right of way,” Trimble said explaining that the signs would need to sit back on side streets away from Hwy. 515 itself. The gateways, designed as archways with mountain scenery and stone pedestals, would be back lit as to be visible at night and are designed to hold seasonal posters to display festivals and happenings in town. Suggestions came from council to perhaps look into painting the Windy Ridge Road overpass to go along with design and planning. This option would require grants and permits, as well as permission from the state, but Trimble noted that it has been done in other towns and would be worth looking into. Discussion also arose about the business directory or “you are here” map kiosks. These freestanding structures will be double sided and not only display downtown businesses, but also parking areas and trolley stops. “There is an opportunity for advertising on this and it is something that we haven’t developed further,” Trimble stated of the kiosks. Conceptual designs for most signage downtown including parking and business directory kiosks. Trimble presented the idea of digital maps as an option: “That way as businesses change it would be easier to change it.” She also noted that it would give more opportunity for advertising and that the advertisements might be a way to supplement income to purchase the new signage. Trimble replied that it would just be key locations for the time being. 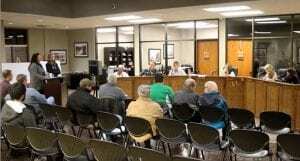 She noted that certain areas of town might experience more street scaping such as Roberts Way and the City Park, and would not move forward in those areas until work is completed. Council chose to move forward with obtaining pricing for the new way-finding signs and this information will be presented in a later meeting. Blue Ridge, Ga. – The Blue Ridge Council held a special called meeting to discuss the creation of the Downtown Development Authority. During this meeting the discussion of nightly vacation rentals in the downtown area garnered much attention. The city has proposed a “City of Blue Ridge Short Term Vacation Rental Ordinance”. The Blue Ridge Lodging Association represents approximately 10 rental companies with over 500 different types of rental properties in our area. Stam said that concern falls in the application process that the city is requiring, stating that it “seems a little bit cumbersome”. According to the proposed ordinance, an application for a short term vacation rental certificate shall be submitted along with a non-refundable application fee to the City of Blue Ridge. Along with proof of homeowners insurance and having staff available 24 hours a day for contact, the applicant would have to submit a large amount of information pertaining to themselves as well as the guests. b. Appear on the premises within 24 hours following notification from the City Clerk, Police Chief or the City Attorney, or his/her designee, of issues related to the use or occupancy of the premises. d. Monitor the short term vacation rental unit for compliance with this ordinance. 9. Proof of homeowner’s insurance. B. Registration under this code section is not transferable and should ownership of a short term vacation rental change, a new application is required, including application fee. In the event of any other change in the information or facts provided in the application, the holder of the short term rental certificate shall amend the filed application without payment of any additional application fee. The ordinance goes further to state that “vacation rentals may be offered to the public for rental following issuance of a short term vacation rental certificate, receipt of an occupation tax certificate, and payment of any and all applicable State and City taxes” but does not address zoning. Mayor Donna Whitener pointed out that currently short term rentals are only allowed in commercially zoned properties and are prohibited in residential zones, but acknowledged that there are rental properties in residential areas already. “I’ve had a lot of people in the community who say they don’t want it in the residential areas,” council member Rhonda Haight said of possibility of allowing these rentals to continue. After brief discussion Whitener suggested “cleaning up” the language of the ordinance to clearly define areas in which these short term rentals can be offered. Further discussion is expected at the next Blue Ridge City Council meeting to be held on tonight, Dec. 11 at City Hall. 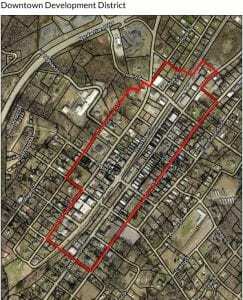 Blue Ridge, Ga. – A Downtown Development Authority (DDA) could be in the near future for the City of Blue Ridge. Opposition from some to creating this organization became overshadowed by the need for the city to obtain more funding, and certain funding and grants can only be obtained by a DDA. Proposed boundaries of the downtown district in which the DDA will focus and serve. Beyond gathering extra funds for the City of Blue Ridge, a DDA will also be a policy-making body and a major decision-making entity that plans and manages the downtown area. Ann Arnold, who has 31 years of experience with DDAs and their development, was asked by the Mayor and Blue Ridge City Council to step-in in assisting with the creation and structuring of Blue Ridge’s DDA. Arnold not only created a draft of the outlines for the new DDA, but also examined Blue Ridge for appropriate boundaries of a designated “downtown area” and interviewed potential applicants to fill the 7 member board. In a special called Blue Ridge City Council meeting Arnold laid out her recommendations on all areas including who she felt would be ideal members of this inaugural board. Arnold stated that many of the applicants had already researched the role of a DDA and was familiar with the laws in which they would be working. Some applicants even went as far as to reach out to other DDAs in researching the role they would potentially be filling. John (Jay) Hamilton to serve 6 years through Jan. 1, 2019 – Dec. 31, 2024. Nichole Potzauf to serve 6 years through Jan. 1, 2019 – Dec. 31, 2024. Gene Holcombe to serve 6 years through Jan. 1, 2019 – Dec. 31, 2024. Michelle Moran to serve 4 years through Jan. 1, 2019 – Dec. 31, 2022. Cesar Martinez to serve 4 years through Jan. 1, 2019 – Dec. 31, 2022. Jeff DePaola to serve 2 Years through Jan. 1, 2019 – Dec. 31, 2020. After Arnold gave her recommendations for board members she moved on to discuss the boundaries of the designated downtown area. “The resolution does require that you (the city) designate the downtown development area that the downtown development would be serving,” Arnold said explaining the need to have clear boundaries. The recommendations show the boundaries being roughly East First Street to the East, West Second Street to the West, McKinney Street to the South, and River Street to the North. Arnold questioned the sunset provision and said to the council that DDA and the City Council should be viewed as a team. 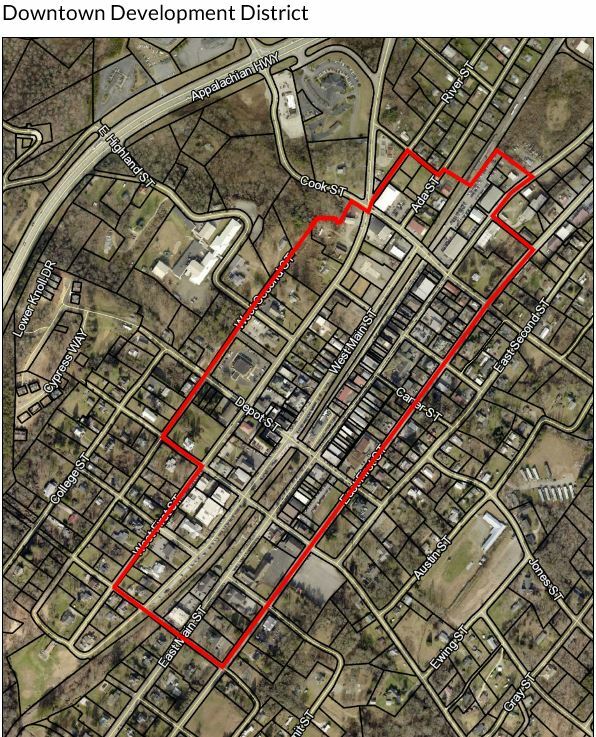 Further discussion and possible enactment of the DDA is expected to take place at the upcoming Blue Ridge City Council meeting to be held Tuesday, Dec. 11 at City Hall. Blue Ridge, Ga. – At their regular monthly meeting held on Tuesday, Nov. 13 the Blue Ridge City Council voted to move forward with the possibility of adding more parking spaces in the downtown area. Phase one of the concept design for parking at Blue Ridge City Hall. 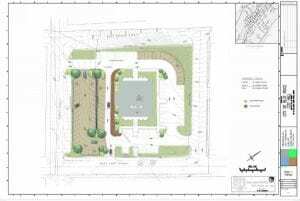 The idea of adding parking to the existing location of Blue Ridge City Hall, located on West First Street, is not a new one, but Kevin Whipple, a principal architect with CSC Design, Inc., introduced a fresh look at Blue Ridge’s long standing parking issue. Whipple along with Reid Dyer, Vice President of Hayes, James and Associates, Inc., proposed a multi-phase concept that when completed would bring the total number of parking spaces on the property from 48 to 246 including 17 on street parking sites. 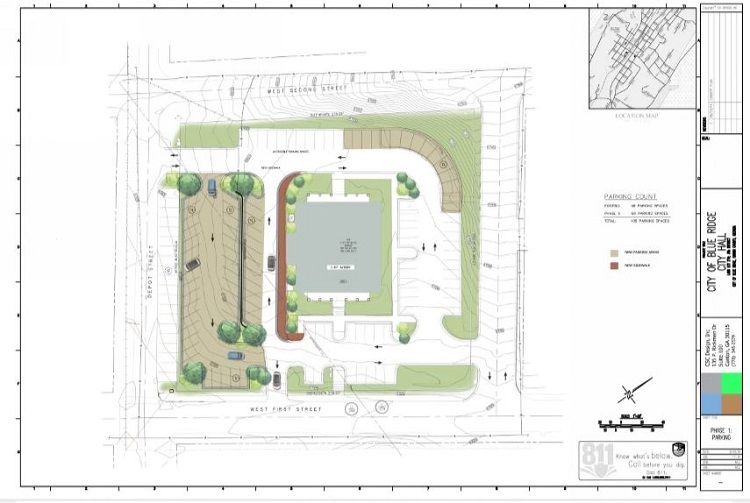 “You currently have 48 parking spaces on the property right now, phase one will increase that for an additional 60, so you will have 108 parking spaces on the property,” Whipple said as he presented city council with diagrams of the proposal. Phase one of the project would require the removal of the green space currently on the Depot Street side of the property. This area would then be turned into numerous parking spots. The phase also including adding a few spots to the back corner of the property closest to the location of the Senior Center. The initial proposal of this phase included the addition of public restrooms to one side of the City Hall building. After discussing with council, however, the options of restrooms in this area was put on hold. Due to the Americans with Disabilities Act (ADA) ramps would be required to access these restrooms. With the lay of the land in the area having a significant slope, adhering to ADA standards would be difficult to achieve. Phase two of the Blue Ridge City parking concept showing lower level parking. It was originally thought that a parking deck could eventually be built in this newly designed area. Dyer pointed out, however, that there were too many utilities located below ground (sewer, storm drainage, power) for this to be a viable option. A parking deck was not ruled out as Whipple and Dyer presented phase two of the proposed parking concept. “This phase would include us taking the road. 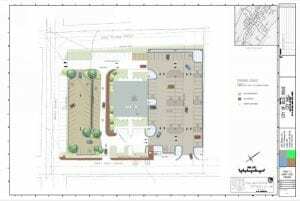 The road between here and the senior center,” Whipple said presenting the second phase. According to Whipple by taking the street, the City of Blue Ridge would be able to add numerous parking spaces on ground level and open up the option of adding a second story parking deck over this area. Parking on ‘ground level’ would have a single entry point from West First Street and would allow access to all parking spaces around City Hall. Parking for the ‘second level’ would have a single entry and exit point located on West Second Street. This single entry/exit point will have many benefits according to Whipple and Dyer. The lay of the land behind city hall, being a rising hill, is a natural elevation ideal for creating this second level. Whipple also pointed out that it could be used as a secure parking area for all visitors who are partaking in a trip on the Blue Ridge Scenic Railway, and suggested that riders of the train be given a parking pass and only those with passes would be able to access this second level. 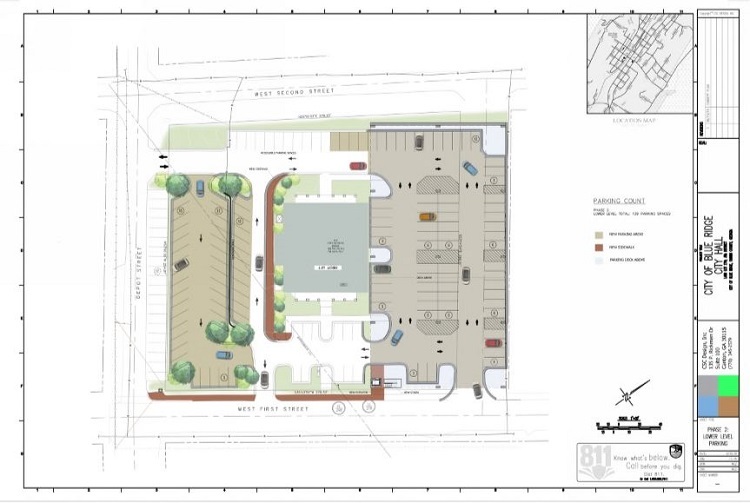 Phase two of the Blue Ridge City parking concept showing upper level parking. After the phase two completion, a total of 246 (including 17 spaces available on Depot Street) parking spaces would be created for public use. Members of the Blue Ridge City Council had many questions concerning the project including how storm water runoff would be handled, but with the design being in its concept stage more research would need to be done to come up with solutions and costs. “This isn’t what I had envisioned, but I love it,” Council-member Rhonda Haight was the first to speak up about the proposal. Haight complimented how the design incorporated the use of the natural slant of the land. Mayor Donna Whitener agreed with Haight and pointed out that its structure would be less intrusive at the City Hall property. Haight motioned to grant permission for more research to be completed on the project, and Council-member Nathan Fitz made a second. The council voted unanimously to move forward. In the meantime the City of Blue Ridge has extended the arrangement with Blue Ridge Hotel, LLC. to continue to use property on West Main Street for paid public parking. The extension will last through Dec. 2018. 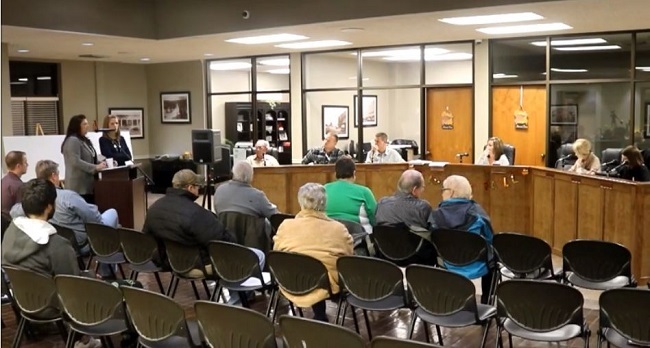 Blue Ridge, Ga. – Discussions on whether the Fannin County Water Authority (FCWA) would see a price hike has been a hot topic this year, and the Blue Ridge City Council solidified that this rate increase would take place at their Nov. 13 meeting. Currently the FCWA purchases water for its customers from the City of Blue Ridge at a wholesale rate. This rate had been debated early this year as being under normal wholesale prices. Rebecca Harkins, Utilities Director for the City of Blue Ridge and Alicia Stewart, the city’s Finance Director, presented to the Blue Ridge City Council a breakdown of why a wholesale rate increase is necessary. Rebecca Harkins and Alicia Stewart address city council on their findings regarding the wholesale water rate. Harkins pointed out that the expenditures and data collected was based on the previous year of 2017. Currently FCWA purchases water at a wholesale rate of $3.25 per 1,000 gallons. This rate is approximately 25.65 percent of what a consumer directly supplied by the city pays. The goal of the City of Blue Ridge is to bring the wholesale rate up to 50 percent in yearly increments. The proposed rate increase would put wholesale prices at $4.25 per 1,000 gallons and bring the percentage closer to 33 percent. Harkins and Stewart also had a third party rate study conducted by Phillip Reid, Georgia State Manager for the Rural Assistance Community Project. This third party review was conducted at no cost to the city. According to Harkins, Reid looks at the percentage of water used versus the percentage of revenue and through his findings had also recommended the rate be set at $4.25 per 1,000 gallons with an increase to $5.00 per 1,000 gallons the following year. “The only difference I came up with is that in the second year of rate increase it would look more like $5.25 if you factor in inflation,” Harkins stated of her findings. Council member Rhonda Haight questioned the current total amount of debt the City of Blue Ridge faces in regards to its water system. Stewart replied approximately $14 million. This debt according to Haight must be taken into consideration when negotiating rates. Haight further commented that she felt the city should not be locked into a set price with the FCWA and should be able to evaluate rates if more debt is obtained. Mayor Donna Whitener suggested the city holding a workshop where Reid could go over all findings and explain to the public the cost of running a water system. 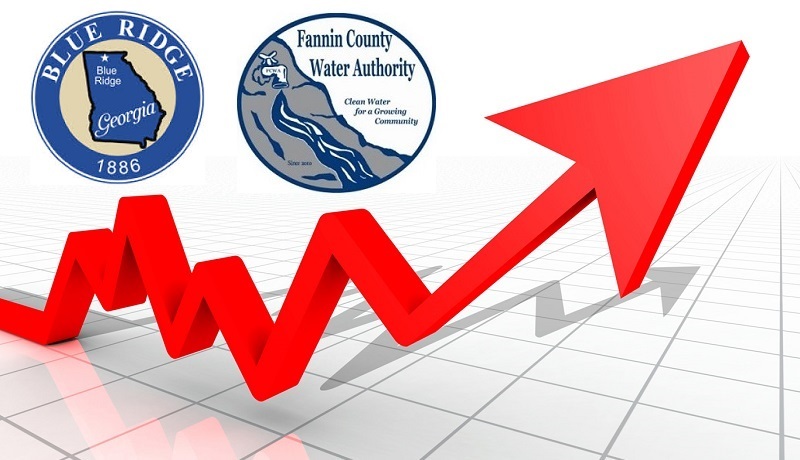 While contracts are still being worked through between the City of Blue Ridge and the Fannin County Water Authority, the city council did vote to raise the wholesale water rate to $4.25 per 1,000 gallons effective Dec. 2018. The city of Blue Ridge audit has been reviewed by Welch, Walker & Associates and they found no issues or changes needed to be made in the report. This information is summed up from December 31, 2017. The audit was finished in June of 2018 and has been approved with no changes. The auditors are looking at items like capital projects, funding, big downtown projects, and new water rates. The auditors judge the financial reports based on a three-tier system: the highest level is 3) Material Weakness (most serious issues), 2) Significant Deficiencies and the lowest level is 1) Management Comments—these aren’t even shared in the report as they are minute. Findings found in the Blue Ridge financial report that are tested. There were three Significant Deficiencies findings within the Blue Ridge audit. 2015-01: “Lack of segregation of duties” and this is a very common finding in a ‘small-town’ community. This just means that there’s only one person working in a position where mistakes can be made and there’s no additional person to go back and check over reports, data entry, etc. 2015-02: “Lack of contract for revenue transactions” a few years ago it was spotted that the franchise tax agreement between the tri-state EMC and the city of Blue Ridge is outdated and it’s not been renewed officially on paper. There are a few things that need to be updated within the contract and it needs to be signed by Tri-State EMC. This has been addressed and is something the city of Blue Ridge has been working on. 2017-01: “Rates were not calculating properly in the software” this is a new finding but has already been addressed and fixed. For the new water bills in 2017, the rates were not calculating correctly in the software but was fixed in May of 2018 while they were going over the audit. Since the amount of money was ‘material’ it needed to go in the report. The ‘material’ amount was 32,110.00 from 2017 and 12,850.00 from January-May of 2018. The 2017-01 error was the city’s software error and will not be charged to the citizens of Blue Ridge. Appalachian Propane has been the previous supplier for gas for the city of Blue Ridge and its employees for the last several years. Last calendar year, the city of Blue Ridge put out a bid for gas—as per usual—and where they normally get at least three bids back, this time, they only received one bid from Appalachian Propane. While discussing Appalachian Propane’s bid, new council members wondered aloud what the current rate was. 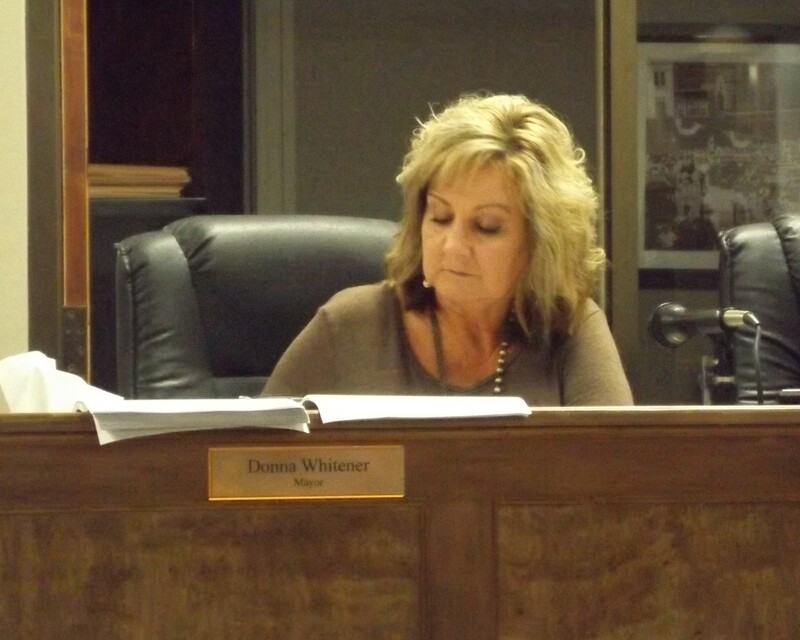 Now, the city has the option to not reveal the single bid so that they may rebid, however, the city council and Mayor Donna Whitener decided to publicly state the amount of the single bid. Had the newer council members known this, they may not have asked to hear the current rate. Even though propane prices are based on an open market, some council members were unsure about the current propane rates. This year’s propane price is $1.44 for City and $1.54 for employees. After some digging, Finance Director Alicia Stewart found the price which was reported as $1.04. Council member Gaddis second’ the motion and then they discussed whether or not there was an ‘official’ contract between Appalachian Propane and the city of Blue Ridge. A city official responded that there may not be a contract because Blue Ridge usually goes with the bid that offers lowest rate. Where will the Blue Ridge Council members go from here? Stay tuned for next month’s council meeting.